Heroin is believed to pose a high risk of addiction. As a result, New Jersey prosecutors have a tendency to seek maximum punishments in heroin possession cases. Of course, this only exacerbates the problem because it does nothing to address the root of addiction. If you are convicted of heroin possession in New Jersey, you are likely to receive a stiff prison sentence instead of treatment. Thus, if you are arrested for heroin in Essex County, NJ, your best hope is to speak with an experienced criminal defense attorney who can help you avoid the most serious penalties. The Tormey Law Firm represents clients charged with drug crimes, like heroin possession in East Orange, Bloomfield, Irvington, Belleville, Newark, Nutley, and everywhere else in Essex County. Our attorneys have handled thousands of drug cases in courtrooms throughout the state, so we are familiar with NJ drug laws and legal procedures. A member of our drug defense team previously served as a county and municipal prosecutor, which gives us an edge when we fight your charges. If you or a loved one has been charged with heroin possession in Essex County, New Jersey, call the Tormey Law Firm office in Newark at 201-654-3464 for a free consultation about your case. Heroin possession is addressed by N.J.S.A. 2C:35-10(a)(1). The statute makes it unlawful for any person to obtain or possess a controlled dangerous substance (CDS) like heroin. The statute classifies the crime as a third degree criminal offense. This means that you will face felony-level charges and you will have to answer the charges in Essex County Superior Court. Possession of heroin anywhere near a school or public park can result in additional penalties. If you are convicted, you may face a minimum prison term of three years, as well as an enhanced fine of $150,000. Moreover, since this offense implicates the Brimage Guidelines, you might not be eligible for leniency at sentencing. Keep in mind that a heroin possession charge can easily be upgraded to a heroin distribution charge. In fact, if you are found in possession of more than 1/2 ounce of heroin, you may be charged with intent to distribute. If this happens, that stash of heroin that you were keeping for personal use could get you labeled as a drug dealer and sentenced to a very long time behind bars. New Jersey law enforcement is not just cracking down on heroin possession; these days, even being under the influence of heroin can get you charged with a disorderly persons offense. If you are convicted of being under the influence of heroin in Essex County, you may be sentenced to six months in the county jail. 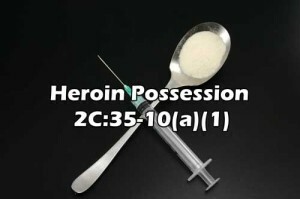 Many heroin possession charges are accompanied by drug paraphernalia possession charges. This is because heroin often requires a syringe or spoon for use. First-time drug offenders may be eligible for probation or admission into a diversionary program like Pre-Trial Intervention (PTI). If you are able to successfully complete PTI, you can avoid jail altogether. Beyond that, there will be no record of a conviction, so you will not have to explain a drug crime conviction to future employers. The experienced Essex County criminal defense lawyers at the Tormey Law Firm have the institutional knowledge and understanding of the NJ criminal justice system that is needed to win your heroin possession case. Call us today at 201-654-3464, or email us to schedule a visit to our Newark office.